Buying a boat is a momentous occasion. Many families dream and save for years before they’re able to make their first boat purchase. They may dream over pontoon, speed, or sail boats. However, once the boat is purchased the decision making doesn’t end. A boat owner must now decide how they’re going to store the boat when they’re not using it. For those who live on the water or who have the ability to tow their boat, the storage answer may be an easy one. For others, however, the decision is a little bit more complex and includes options such as wet or dry docking, on-site or offsite locations, or temporary or permanent solutions. Wet storage at a marina can provide convenience. The boat is stored in the water and when you want to use it, you jump on board and take it out. However, wet storage leaves boats vulnerable to weather and sun damage as well as exposure to birds and other animals. Dry dock storage can provide more protection from the elements and also ensure that the boat is removed from the water after each use, which most boat experts agree is best for the life of the boat. Boats that are dry docked typically maintain their finish and look like new for many more years than a boat that is always stored in the water. Individuals who plan to use the boat a lot in summer months but then park it for winter, may consider temporary storage solutions in which they wet dock the boat for the busy summer months but then find indoor storage for the winter. 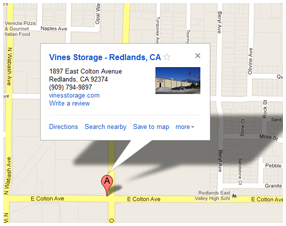 Vines Storage Facility in Redlands, CA, works with many boat owners in the area. Our team can customize our leasing agreements to fit your needs and our facility offers a number of benefits and amenities including security, convenience, and protection. For more information or to discuss your storage needs, call or visit Vines Storage today.